I’ve written several blog postings about the deceptive campaign the opponents are running against the Missouri Taxpayer Relief Act, the ballot measure that is an important step toward tax reform. I’ve also written about the seemingly unlikely role that one of these anti-consumer groups, Missouri Association of REALTORS® (MAR), has played during the debate. MAR is the primary funding source for the group Missourians for Fair Taxation, whose very name is the antithesis of its purpose. Burnham’s Law – Missouri Association of REALTORS® listed a number of falsehoods that MAR is telling its members. It seems they were none too happy when the primary proponents of the Missouri Taxpayer Relief Act – Let Voters Decide – provided information to REALTORS® all across the state about what was really going on. MAR responded with misleading information and held back the real reason for originally objecting to the proposal – it didn’t specifically exempt real estate commissions. Of course, the REALTORS® neglected to point out that they left that out of their Amendment 3 campaign in 2010. Why? Well, probably because they knew that if they had put that in as a part of the amendment, people might realize that the measure was not as altruistic as they thought. Prior to this inaccurate information being disseminated by MAR – and since the proposal was always about eliminating the income tax, and real estate commissions are income – there was no real conflict. 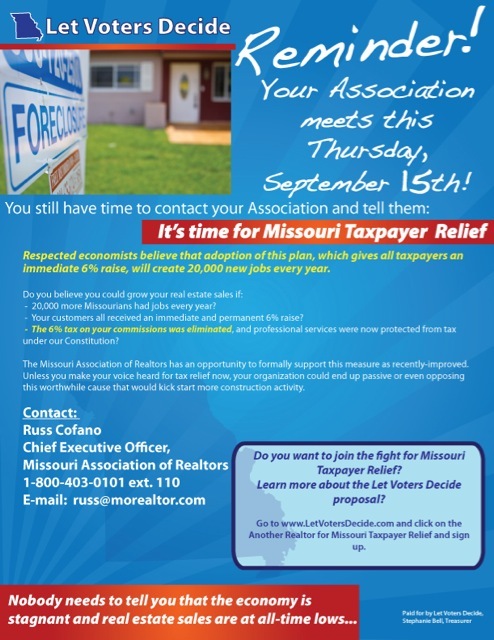 I was invited to participate in discussions with Missourians for Fair Taxation (aka the Missouri Association of REALTORS®) regarding the matter. We met with the president of MAR, their lobbyist, their attorney and their political consultant on April 15, 2011, to see if there was a way to resolve what appeared to be a conflict based on an easy-to-clarify misunderstanding. The meeting was cordial, and it was agreed that the attorney for Let Voters Decide and the attorney for MAR would work out some language that would address MAR’s stated concerns. The summary of this effort can be found here. Once you read the summary, you can understand why the folks at Let Voters Decide and I were surprised at the opposition that MAR still had to the measures. However, once you read the “supporting” details sent to MAR membership, you will understand that it really wasn’t about the issues, but about politics and keeping potential “partners” in the fold in case there ever was a potential, tiny chance that the legislature would try to undo both Amendment 3 and the real estate provisions of the Missouri Taxpayer Relief Act. There is a significant problem with that faulty logic – namely, the legislature can’t undo a Constitutional provision! They have to put it before the voters to change the Constitution. I don’t know about you, but I can’t foresee any time in which voters as a whole would approve anything that would so drastically increase the cost of their homes, whether buying, selling or transferring them. If the story stopped there, it would be bad enough. However, the president of Let Voters Decide attempted to contact the two families who really call the shots at MAR to let them know what had transpired. Surely, they didn’t have the complete information available to them about the issue? A letter was sent to the Mendenhall and Keating families outlining what efforts had been made. To my knowledge, the letter remains unanswered. One source close to the MAR has suggested the reason is that one of these folks is vying to become president of the National Association of Realtors and that this “fight” would help in that cause. If I operated like Missourians for Fair Taxation, I would present that as a “fact.” However, I don’t have confirmation of that and, unlike Missourians for Fair Taxation, I will tell you that I do not know whether it is factual or not – rather than just tell you it is. Regardless of the validity of anyone’s political aspirations within the national organization, the fact remains that MAR is willing to sacrifice the demonstrated potential for state economic growth represented by the Missouri Taxpayer Relief Act. It’s particularly peculiar, given that the tax reform proposal would in turn create the potential for more sales as people move up to bigger houses, or move into the state and need a home. They are willing to sacrifice your economic opportunity to protect their political position. PreviousSpecial Interests Oppose Needed Tax Reform! The Missouri Minute – Episode 8 on Voter Fraud!